Organic sloping design that offers a stand-out look engineered for everyday stability and for 'high chance of precipitation' locations. With smooth lines and contoured shape, this unique precast bench encourages people to sit, relax, and enjoy the community. 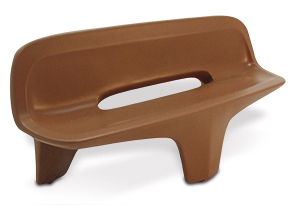 Constructed with stoutly durable reinforced ASTM compliant concrete, this bench is designed to withstand even in harsh climate conditions. The unique tripod footing provides stability and style, and with variety of standard and premium finishes it's sure to liven up any landscape.